It took just eight ants for biologist Ehab Abouheif and his team to know they were onto something unusual. 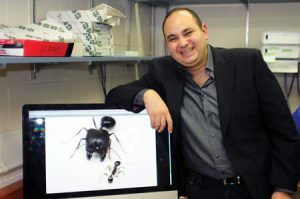 After 15 years spent in fields beside a highway in Long Island looking at ants from the Pheidole morrisi species, the researchers came across a number of specimens with huge oblong heads and giant vicious mandibles. The remarkable thing is, these kinds of ants weren’t supposed to be there in the first place. Supersoldiers are normally found in only eight of the more than 1,100 Pheidole (big-headed ant) species, and all of them live in the southwestern U.S. and northern Mexico. They use their large heads and powerful jaws to protect the entrance to the nest from attackers. In ant colonies, there are millions of workers. Depending on the food the ant larvae are fed, they then develop into soldiers or minor workers. So, after travelling to Arizona to collect some of the supersoldiers in species where they occur naturally, Abouheif and his team, along with colleagues from the University of Arizona, set out to see whether they could artificially induce ants to become supersoldiers. And they were very successful in doing so. The team discovered that by applying juvenile hormone to larvae at critical stages in their development, they were able to trigger the production of supersoldiers in at least three species in the genus where they have never been seen before. Moreover, these species are widely separated in the evolutionary tree of Pheidole. This led Abouheif to hypothesize that, like the supersoldier ants that the research team had found in Long Island, some of the anomalies that appear in nature on a regular basis are in effect expressions of dormant ancestral genetic material. These findings are groundbreaking for evolutionary theory, according to Abouheif, because they show there is dormant genetic potential that can be locked in place for a very long time.